Escaping the real world, by travelling half way round it…. When I got back to Cairns the first thing I did was collect the debit card I had been waiting a little over a week for. Naturally the second thing was to spend well over a week’s worth of money. Not that I was just squandering it because I could, now it was time to book trips and tours and do the kind of things you come to the East Coast of Australia for. The first of these was for the very next day with a company called Barefoot tours. The driver/tour guide of which, Brett, was indeed barefooted. 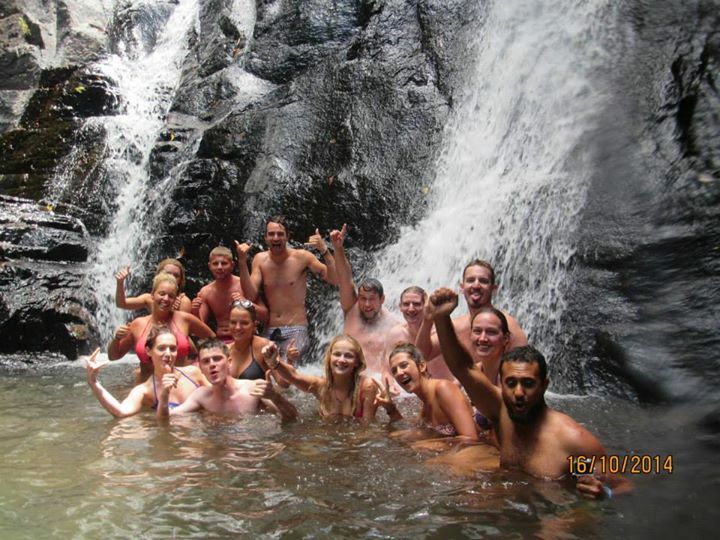 Not far from Cairns is an area known as the Atherton Tablelands, and this was where our small group would spend the day exploring, sightseeing, and most importantly, swimming. But not before picking up our final passenger however, Steve the pet rock. After a quick stop at the rather impressive Cathedral Fig Tree we arrived at Lake Eacham, which had formed in the crater of a long since dormant volcano. Dipping my feet in the almost cold water I decided the only way to immerse myself was indeed by jumping in at the deep end. Maybe the water by the pontoon wasn’t quite as deep as the deepest point of 70m, but deep enough that I could dive in, not reach anywhere near the bottom, and still take a much longer time than expected to surface. While not everyone joined me swimming in the refreshingly cool water there were others who decided to jump in via the overhanging tree off the shore. The tree that Brett told us we weren’t allowed to jump from, whilst nodding his head somewhat emphatically. This carefree swim was followed by a brunch of fresh fruit, muffins, and Tim Tams, before we drove on to our next destination, Dinner Falls and The Crater. Not needing much more of an explanation, it is also known as the Mount Hypipamee Crater, but pretty much is The Crater. Like Eachem it was a dormant volcano that had filled with water, but the lookout at the top of the crater is as high above the surface as the Sydney Harbour Bridge is above its own harbour. Dinner Falls is served cold. Somewhat colder than Lake Eachem, at Dinner Falls we all took turns cringing at the yelps of those in line ahead of us, before adopting comical poses and jumping in ourselves. We then swam across to the waterfalls, sitting underneath which was not unlike receiving a massage from someone with cold hands. Millaa Millaa falls was next, which despite not actually being the waterfall from Peter Andre’s Mysterious Girl video as we had been told (I checked when we got back, that one’s in Thailand), it was still the one from the Herbal Essences advert. 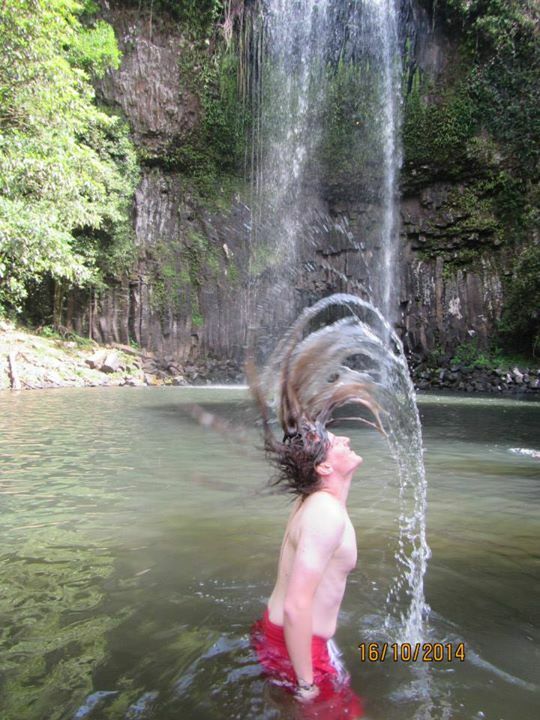 As much as I couldn’t gloat to all the Peter Andre fans I know back home, at least my fabulous hair flick photo was still valid. Before reaching our final waterfall however, there was an unplanned stop that surprised all of us when the bus ran out of fuel. It would have been nice if the bus had done this at one of the waterfalls we came to enjoy instead of by the side of a road in-between, but I guess you can’t have everything. A few of us got out to stretch our legs whilst at the same time letting them get bitten by mosquitos, and waited for the RACQ to come and lend a hand. One with a Jerry can in it. As much as it was an inconvenience, I merely adopted my attitude of not worrying because it’s no worse than anything that’s happened back home, and still smiling because at least I was in Australia. And not just Australia, but north Queensland also has some of the most breathtaking scenery I have ever seen. 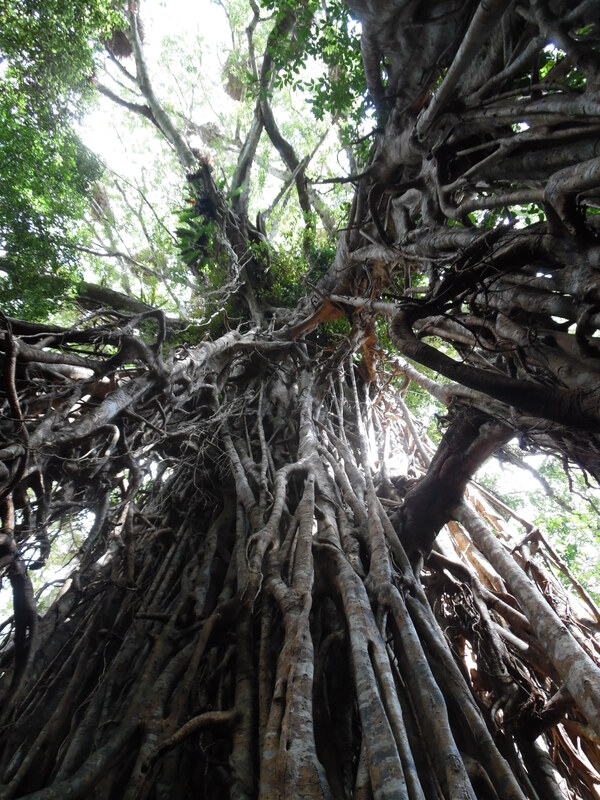 Despite being so near the coast, the Atherton Tablelands actually reach up to 1,200 metres above sea level, and are part of the world heritage listed Wet Tropics. Our day consisted of driving through pasture lands and rainforests, and more than one national park. We only stopped in the middle of a patch of tall grass that wasn’t that exciting, but was still tall Australian grass. Luckily there was still enough light to enjoy Josephine Falls, and the small natural water slide that had formed on one of the smooth rocks. Not as long here as we had hoped, but it was still enjoyable nonetheless, as was having our afternoon tea on the party bus back to Cairns. It had neon lights and everything. My one night in Brisbane was merely a stopover before starting my proper journey along Australia’s East coast in Cairns; I figured I’d begin in the north and make my way down towards Sydney and Melbourne where I would catch up with some friends over here. This time of year I’d also be enjoying the sun, but keeping one step ahead of it as it got hotter and brighter. Although I was heading south for the winter as far as not being in Britain was concerned, I also wanted to make sure I wouldn’t overdo it in the Australian summer. As much as this plan is still pretty much in tact, and although I had booked a full week in Cairns to begin with, my southbound plans took a while longer to get off the ground than I had expected. I booked a package deal which included membership to Job Search Australia along with several other benefits, one of which was an Australian bank account. Arriving at the Calypso, the Base associated hostel in Cairns, early on a friday evening meant I had the weekend to relax after my flights, which I thoroughly took advantage of. I went to the Job Search desk early monday morning, where my induction to the world of job seeking in Australia was unhindered by the Labour Day public holiday. Thanks to things like data protection however, I had to sort out my bank account myself, although was told how to do this. Thanks to the holiday, I also had to wait until the next day to sort this out. Tuesday morning though I went to the Cairns branch of the Commonwealth bank, and also opened a savings, and superannuation accounts alongside the general current account into which I deposited my travellers cheques. Old fashioned I know, but online transfers weren’t really the thing last time I went travelling, and at least the cheques didn’t come with transfer and/or currency conversion fees. But one thing they did come with, was a three business day clearing period, and I was also told my debit card would take seven to 10 days to arrive. Despite this however, I’d done more to plan for a pension in a long weekend in Australia than I had in 29 years back in Britain. As much as I had to wait to get to the money in this account, I did still have a British debit card, and also an STA travel card, so wasn’t completely without access to any money, just limited as to how much I could spend. Time to get comfy, and enjoy Cairns for a while. In Down Under, Bill Bryson describes Cairns as having a “devotion to the tourist dollar”, which is pretty accurate. 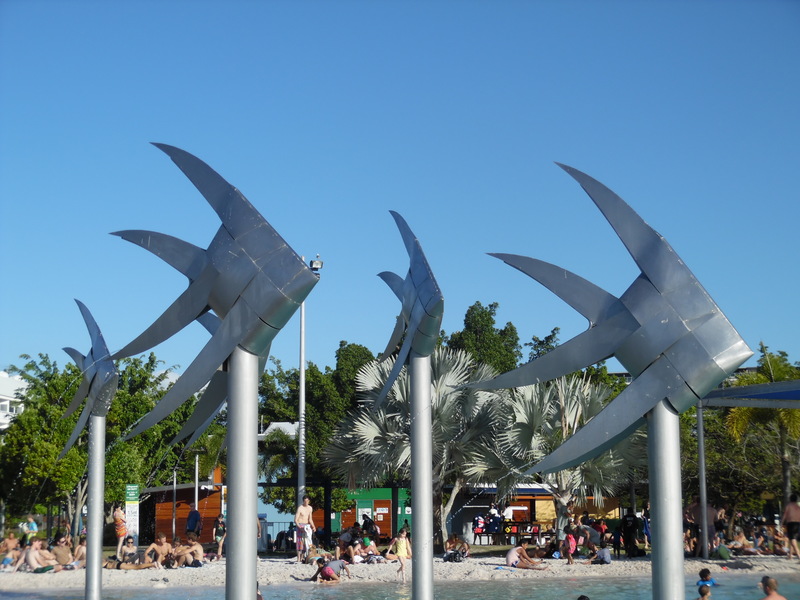 “Every second business offered reef cruises or snorkeling expeditions, and most of the rest sold T-shirts and postcards” sums up the centre almost perfectly, although whether they are merely a new addition or Bryson chose not to mention them, there are also a number of adult shops and dancing establishments. I saw one particular climbing frame and slide in the street just in front of a store with a large “erotica” advertisement, and thought about taking a photo of this strange juxtaposition. Aussie laid back nature notwithstanding, getting noticed with a camera in a children’s play area before my trip even began probably wasn’t worth the risk though, and so I decided against it. Having to survive on my own rather limited supply of tourist dollars, I instead spent my time in Cairns doing not much other than relaxing in the hostel, chilling by the lagoon, and dining on $5 pizzas from the Pizza Hut across the road. Needless to say, it probably wasn’t the best week in terms of working on my beach body, but then it’s not like I had one to begin with anyway. Notice the tape round his mouth. And the blood. The Calypso, like many hostels over here, has its own swimming pool, and also arranged different activities and entertainment during the evenings. 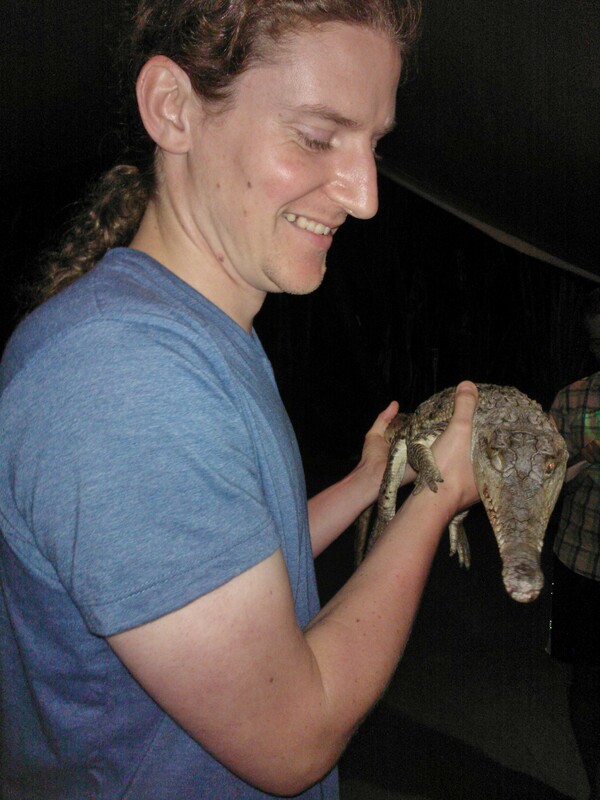 These included bar pong tournaments and lizard, snake, & crocodile handling, all of which were in the open air bar/communal area which was also just a great place to meet and chat with other backpackers. Although this technically included people from all over the world, I think everyone except one girl from Canada was from Europe, and 90% of which came from either Britain or Germany. Not that I minded, as despite everyone’s ability to speak great English, it also gave me a rare opportunity to practice and show off my A level German. For a city (not much more than a town really, just the biggest place for hundreds of miles) famous for its opportunities to do everything from riding classic steam trains to skydiving, there are certainly worse places to spend a week doing next to nothing. Most underrated album of the 90s. Discuss.